In the Marine Corps, Airborne and Air Delivery Specialists are trained to airdrop needed supplies to Marines in combat zones and other areas where they have limited access to supplies. These specialists make sure supplies are packed, the equipment is working, and the mission plan is sound. The Marines categorize this job as military occupational specialty (MOS) 0451. Marines in MOS 0451 hold down three main areas of responsibility: air delivery, equipment maintenance, and parachute packing. Similar to the work done by loadmasters, Marines in this job have to figure out the safest way to pack and distribute equipment loads on the plane. There's more to it than throwing your luggage aboard before a flight, obviously – since in this case, your "luggage" weighs a ton and it's wearing a parachute. Let's not forget, it's a poor idea to blindly trust that everything's in working order when you're planning to drop a pallet (or a person) from miles above the ground. Mundane though it may sound, it takes a dedicated team of air delivery specialists to make sure all of the equipment needed to perform the airdrop is in working order. Like all aspiring Marines, an enlistee aiming to become an Air Delivery Specialist must have a high school education. The MOS is restricted to US citizens and only accepts volunteers. On the Armed Services Vocational Aptitude Battery (ASVAB) tests, recruits need a general technical score of at least 100, with no exceptions. And because it's a huge part of the job to be involved in dangerous jumps over water, recruits must achieve at least an intermediate-level qualification during the water survival phase of boot camp. If you're already a Marine serving in another occupational field, the Corps' MOS Manual clearly states you can only move into the 0451 field if you're a lance corporal (E-3) or corporal (E-4) with less than six months in that rank. 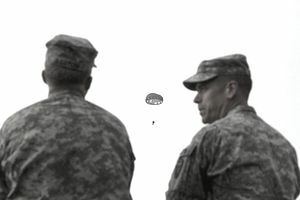 Sergeants (E-5) and below in the Active Reserve program may also be able to move into air delivery if full-time vacancies are available at a reserve unit. The complete training package for a new 0451 takes about seven months at a minimum, counting boot camp and Marine Combat Training. The aerial delivery phase teaches students to prepare an airdrop from start to finish. This phase of the course concludes with a live airdrop, where Marines pack the cargo parachutes, rig the loads to be dropped, place the loads in the aircraft and recover the loads and equipment once the goods are dropped. The aerial equipment phase teaches Marines everything they need to know about inspecting, fixing, and maintaining parachutes and airdrop equipment. The parachute packing phase is pretty self-explanatory. But lest you think learning to pack a parachute sounds boring, here's the twist: To make sure you've been staying awake in class, you'll be required to jump the parachute you packed during the examination. Obviously, if you're going to be jumping with the parachute you packed, you need to know how to jump. That means as a 0451, you get the added perk of attending Army Jump School, a school so coveted by Marines that the limited seats afforded to the Corps are frequently used as a reenlistment bonus. What Does a Combat Documentation/Production Specialist Do in the Army?